Der LTG ist ein sowjetischer leichter Panzer der Stufe 7. Dieses Projekt für einen leichten Panzer wurde 1944 von Gawalow im Gorki-Automobilwerk entwickelt. Mehrere extrem ungewöhnliche Lösungen wurden im Fahrzeug eingesetzt: ein Fahrer saß ich Kampfraum, sein Sichtgerät wurde in der Luke im Turmdach eingebaut. Das Gerät war mit der Position des Fahrers verbunden und rotierte mit dem Sitz gegen den Turm. Das Projekt wurde in der Entwicklungsphase aufgegeben. Der LTG führt zum LTTB. 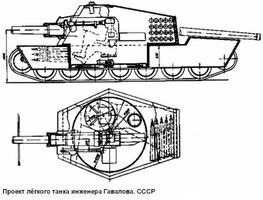 The LTG, also known as the "Gavalov" tank, was a Soviet light tank design dating to 1944. It was designed by I.V. Gavalov, who previously worked on other light tank designs including the T-70. In this project, the crew compartment was situated in the turret,w while the engine was apparently in the back in lying position. Fuel tanks and a part of stowed ammunition were located in the “nose” of the vehicle. In the turret, on the right side from the gun was the driver, the commander of the vehicle was behind him and on the left side, there was the gunner and loader. Furthermore, the engine was placed horizontally (the cylinders were horizontal), which, along with placing the crew in the turret, reduced the height of the vehicle. As mentioned earlier, the driver’s seat was “stabilized” – when the turret turned, the driver stayed looking forward – this was possible thanks to a special chain transmission and the fact that the whole turret was “sitting” on the bottom of the tank on a pivot, not unlike the one of the anti-aircraft lafettes. Effectively, the driver was sitting on the turret axis and the whole thing rotated around him. The driver was also sitting above the rest of the crewmembers, looking out via a roof-mounted periscope, which was also stabilized. As for the armament,in player-suggested trees, this tank is equipped with either a 57mm ZiS-5, or 76,2mm ZiS-4 and S-54 and characterised as a small, fast vehicle. Historically, it was to be equipped with a long-barelled 76mm gun and a machinegun. The vehicle was supposed to be 1,3m tall, 4m long and was supposed to have 7 large roadwheels. Armor was most likely probably non-existent. * The armor values of the tank were most likely created by Wargaming, as there is no indication of what the values actually were. The 85mm guns were not proposed for this tank. Diese Seite wurde zuletzt am 13. Februar 2018 um 13:43 Uhr geändert.